Another finish to share today! 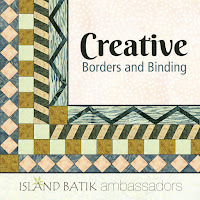 My October Island Batik Ambassador project is now complete and I'm working on a pattern too! I decided to quilt the areas of the foreground fabrics with wiggle-squiggles in the friendship star and the border. The background areas are quilted with loops. I used a mottled khaki for the backing and hanging pocket. For the binding I used the scraps from the 2.5 inch strips! This turned out 36 inches square! Sharing at Linky Tuesday, Let's Bee Social, Needle and Thread Thursday, and Finish it up Friday! This has been a busy, busy month for sending and receiving quilty mail! This month (our last month!) in the Stash Bee, Kim requested bookcase blocks for a manly quilt. I actually picked up a scrap bag with some many fabrics while I was on vacation that were perfect for this block! This month has also been "Get Your Quilty Wishes Granted 3.0" on Instagram! I haven't participated before and decided to grant some wishes as well as to make a little request and was overwhelmed with the response! First, I sent the remaining Grunge Spot left over from my Jolly Bar Jazz quilt to Sey, as well as a fat quarter of a modern print I had in my stash that she was looking for. I forgot to take a picture, but it was an easy wish to grant! Second, I saw that Sarah from Sarah Goer Quilts was looking for more monochromatic blocks, so I told her I would make a few! We were in the same Hive in the Stash Bee in 2014 or 2015. I cut all of the colored squares, but I'll need to go to the store and get some more black and white fabric! 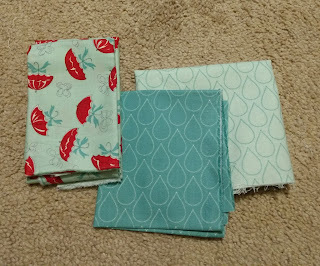 I requested additional fabric from the April Showers line as my quilty wish -- I've gotten two packages and three different fabrics thus far! This weekend I'll be busy finishing up my Faceted Friendship Star quilt, working on my blocks for Sarah, and making my Rainbow Scrap Challenge blocks for October! 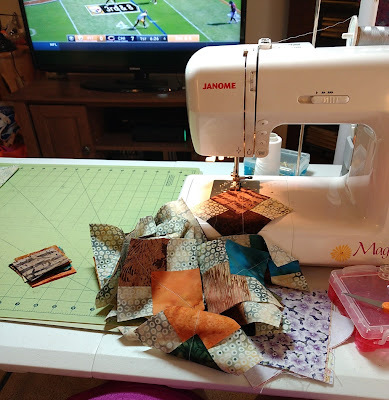 Sharing at Finished or Not Friday and Oh Scrap! Don't forget to check out our Halloween Etsy sale -- all of our Halloween Kits and Patterns are 15% off! I am so excited to show of the finally finished version of this quilt! First, a close up of the last block that I quilted -- the patterns I used are a three-leaf meander in the inner star and a petal motif with a baptist fan center. Pushing myself to do all of the different quilting motifs was a great challenge and really helped me to improve my free motion quilting. But, I probably am going to going to anything this detailed for a while! I used the backing fabric for both the binding and the hanging sleeve. The thread throughout is white. The back is pretty neat looking as well. I had one extra block so I added it into the backing. It's neat to see all of the white thread on the burgundy background as well as all of the different patterns that end up overlapping the block on the back! Sharing at Let's Bee Social, Needle and Thread Thursday, and Finish it up Friday! PS. You can vote for my Argyle quilt in the "Best of Benartex" contest! Click here and like the photo to vote for me! It's so good to cross things off of the sewing to do list -- and I get to do that today! I've finished my the last of my Top Spin blocks and put together the quilt top! 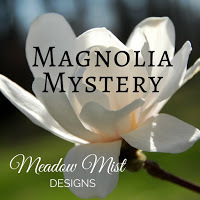 The original pattern by Melissa Corry for Moda Bake Shop is here! I had eight more blocks to finish and they came together quite quickly! I ended up with a few extra medium and small HSTs, but that's totally okay! 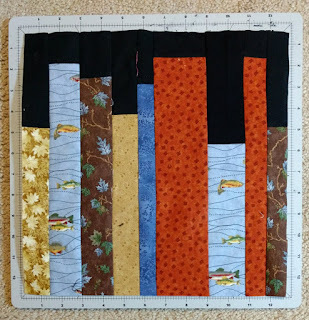 Given the way the blocks are arranged, the only seam matching that I had to do was matching the seams between blocks when sewing together the rows! This made putting the quilt top together so fast! This top is twin sized at 72 by 96. I had a hard time taking pictures of it in my apartment! There's no immediate plan for this quilt, so I am thinking about having it simply pantograph quilted. I have large pieces of yardage to use for the binding and the backing, so I will probably put those together just in case I decide to quilt it myself. Sharing at Finished or Not Friday and Linky Tuesday! After seeing lots of people post their finished units for this month as part of the Magnolia Mystery QAL, I wanted to get mine done as well! This month's direction uses the 4.5 x 2.5 inch Fabric B rectangles combined with background squares to make "half geese". I am using scrappy aqua prints for my Fabric B and I followed Cheryl's suggestion to cut these rectangles in sets of four. When making my half geese units, I made sure that each set of four ended up with two right facing and two left facing geese. I have seven different fabrics -- I think it's a good variety of fabrics that will work well together in a quilt. For now they wait until next month's directions come out! It's time for the pieced border on my Faceted Friendship Star! 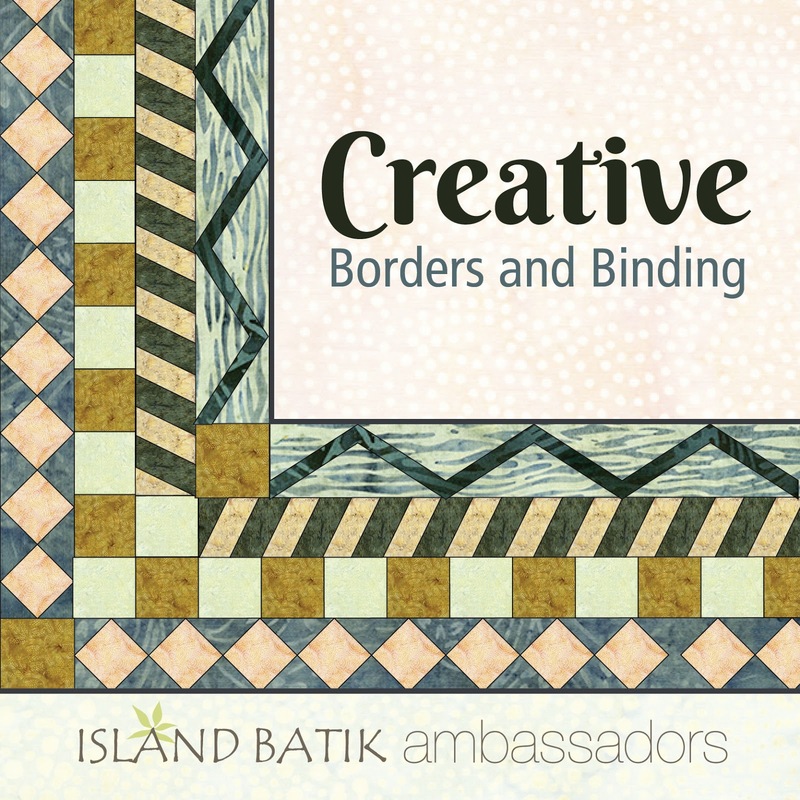 This is where we're really getting into the "Creative Borders and Binding" theme for our Island Batik Ambassador projects! 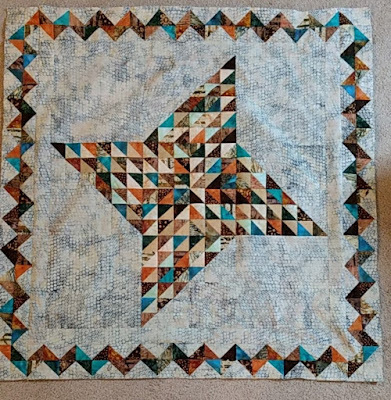 Instead of doing a half-square triangle border for this quilt, I decided to make flying geese (with a few HSTs thrown in for good measure, of course) to build a chevron border on my Faceted Friendship Star. ...and some football too! Followed by a lot of trimming. I also needed to make 12 HSTs in addition to my 80 flying geese to make the pieced border work. I randomly pieced the four small squares with each background square so that it would mimic the random HSTs in the friendship star. This is two rows of flying geese/HSTs units. The top/outer row is 10 flying geese units, the bottom/inner row is 9 flying geese units with a HST on each end. The top row has the geese pointing in and the bottom row has the geese pointing out. I added the border pieces to the top and bottom of the quilt first. The side borders are slightly longer, as you might expect! 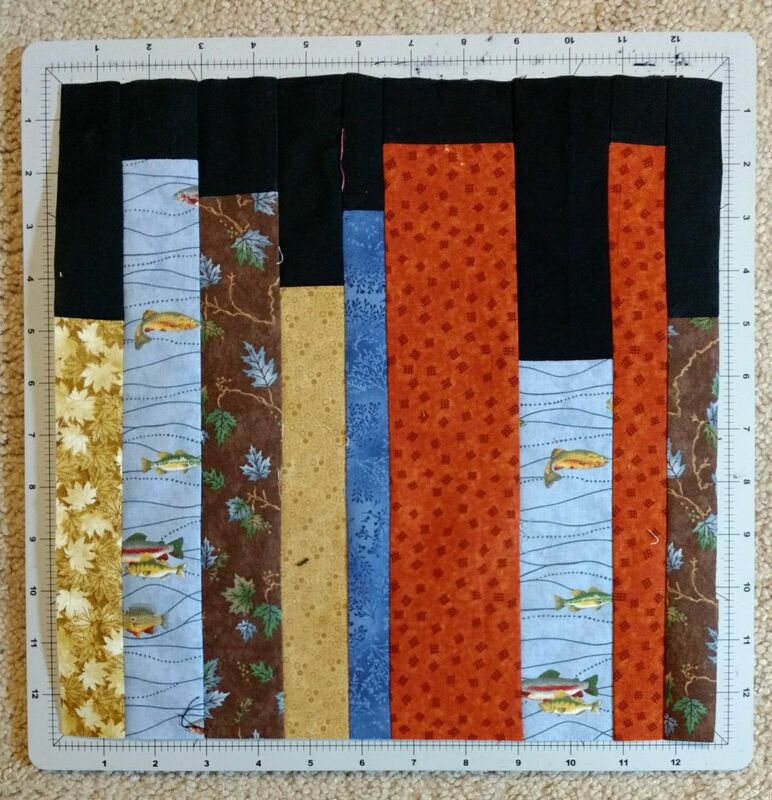 The outer row has 10 flying geese and a background square and HST on each end. The inner row has 11 flying geese with a HST on each end. With the units arranged in this way, you end up with a continuous chevron border that looks like you've made it from HSTs, but is actually made of flying geese -- with a lot less piecing and bulk! Now to quilt and bind this quilt! It's currently 36.5 inches square and I am excited to start working on finishing it! I'm not much of a Halloween person -- but I am a big Halloween sewing fan! 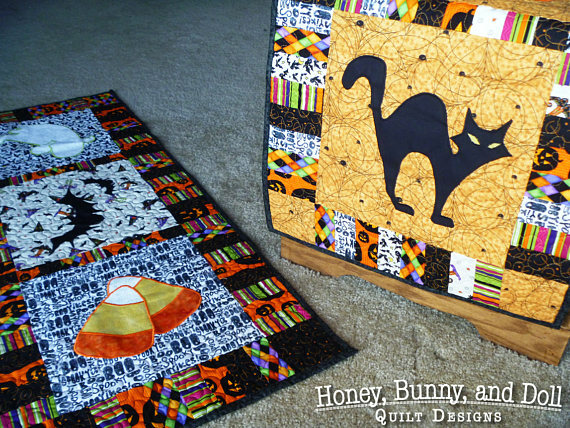 For a short time only, we've put together a new kit for Halloween placemats! 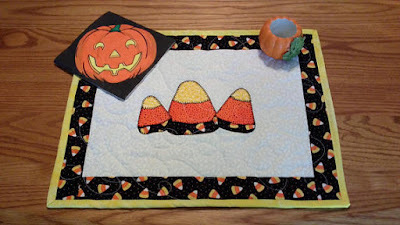 The kit includes all of the fabric you need to make four candy corn placemats using our Seasonal Placemats pattern (set #2). 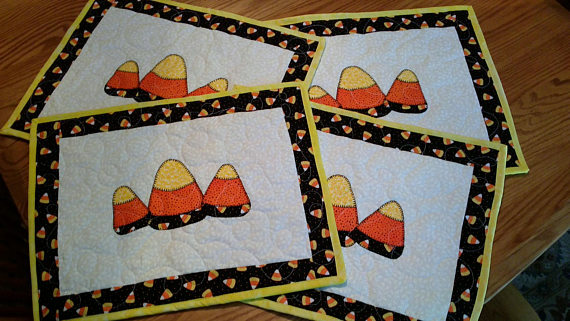 The kit includes off white for the background, the black candy corn print border, black Kona for the backing, yellow for the binding, and small pieces of orange and yellow for the applique. The kit also includes the entire Seasonal Placemats Set #2 pattern -- which also includes patterns for a shamrock version and a flower version. 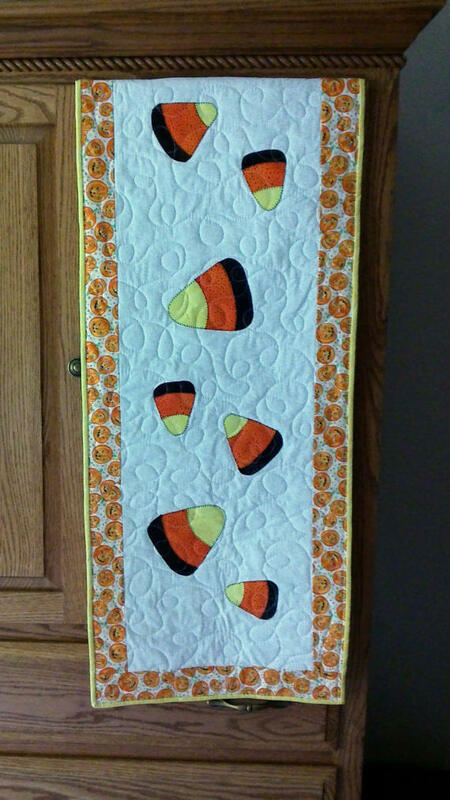 Here's the original version of these placemats that my mom made with pumpkin fabric as the border. 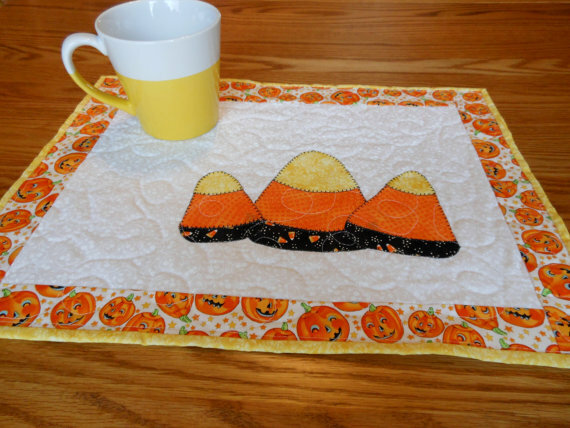 Seasonal Table Runner Set #2 has matching table runners for your place mats too! Don't forget that we also have our Halloween Spooks table runner/wall hanging pattern! This is one of our original patterns and has your choice of six different applique options for a table runner or wall hanging. The fun pieced border lets you show off all of those cute Halloween fabrics we love to collect! I'm going to hang up my Halloween wall hangings when I get home today! It's time for more itty bitty piecing on my October Island Batik Ambassador project! After putting together the small triangle units for my Faceted Friendship Star, I started working on the 9-patch units. I needed to make eight in total - one for each of the four larger triangle sections and four for the center square. I made the four for the large triangle units first, and made sure that each one didn't have any of the same fabrics touching, as well as the light triangles (mostly) pointing in the same direction. These sections are made up of one 9-patch section (upper right), one background square (lower left), and two small triangle units (upper right and lower left). For the center, I made all four units at the same time, making sure that each unit had the desired "spin" as well as making sure that the HSTs on the edges contrasted with the HSTs in the neighboring units. Time to put everything together - my center unit, my four large triangle units, and my four large background squares! My big block now measures 27.5 inches! Here's the big block with the 2 inch border strips sewn around the outside. My next step is starting on my pieced border which will be shared next week! It involves lots of 2.5 inch squares, but not quite as many half square triangles! Sharing at Linky Tuesday and Let's Bee Social! One of the things that I have on my WIP spreadsheet (yes, I have it all in a spreadsheet) is the date that I last worked on a project. I started the list last December when I put together my first Brutally Honest post here on the blog. Now that it's the end of September, one of the things staring me in the face is the group of projects that I haven't worked on since before I started the list. Some of these are scrappy on-and-off projects, but I decided to buckle down and try to finish my 2015 Stash Bee Quilt. So this more-than-half quilted quilt has been sitting on a shelf for at least 18 months without being touched because I got frustrated coming up with new FMQ patterns since I was trying to use a different one in each star. I had four large stars and two small stars to go and now only have one large star to go, along with some pebbles in a few places. Now I only have one start left and then it will be time to trim and bind this quilt!